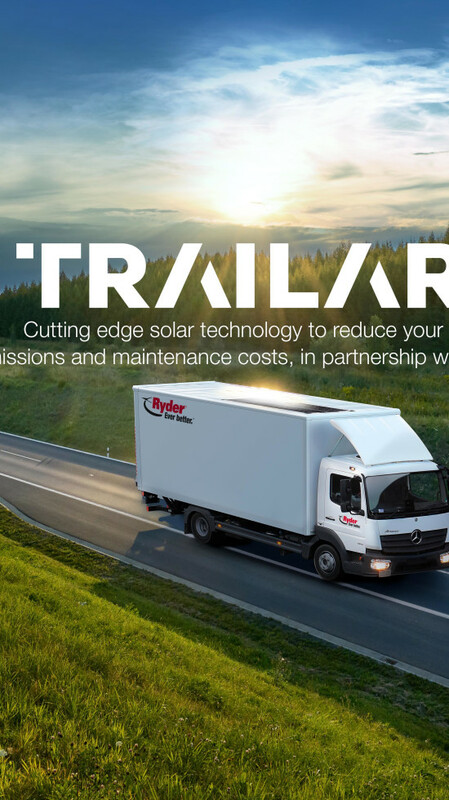 TRAILAR is an ultra-thin, flexible solar film matting system fitted to the roof space of a rigid truck that is directly connected to its battery. The harvested natural energy is used to power all on-board ancillary equipment whilst also helping to reduce your emissions from less engine idling, and extend battery life. Millbrook have conducted tests on TRAILAR proving a 5.24% improvement in fuel economy. For the rigid truck, the drive cycle with tail lift tests with the solar panel connected resulted in a 58.6% improvement in fuel economy. The ancillaries test data was extrapolated over a distance of 189 miles and at a constant 40 mph, the average daily mileage and speed achieved by DHL. This was then combined with the fuel consumption figures from the drive cycle with tail lift tests, which resulted in an overall 5.24% improvement in fuel economy. which means no more engine idling during tail lift use. Supporting Primark through vehicle innovation. “We’re constantly seeking out innovation in our supply chain that delivers cost savings. If a combination of cost saving and environmental impact can be achieved in conjunction with each other then we are all for it. This is why we chose to engage in the TRAIL AR project. It’s delivering both savings and reducing our carbon footprint!" Please tell us about your TRAILAR needs so that we can pass your enquiry on to the relevant team.